Amazing Butter for any Taste, Style & Occasion by Butterball® Farms, Inc. Delight your customers with the flavor and flair of Butterball® Butter. We are famous for our beautiful, high-quality embossed butters in a broad range of designs, shapes, and sizes. We also offer custom butter to some of America’s biggest brands and we'd love to do the same for you. Make a big impression with high-quality butter. The industries we serve are as diverse as our designs and flavor choices. Restaurants, hotels, colleges, caterers, airlines, cruise lines, and many other sectors rely on Butterball® Farms to enhance guest experiences. Because we give every customer our very best: the best tabletop products, the best flavors, and the best service we possibly can. We work in partnership with you to develop the perfect solution, with the goals of cost efficiencies, robust flavor, and excellent quality at top of mind. 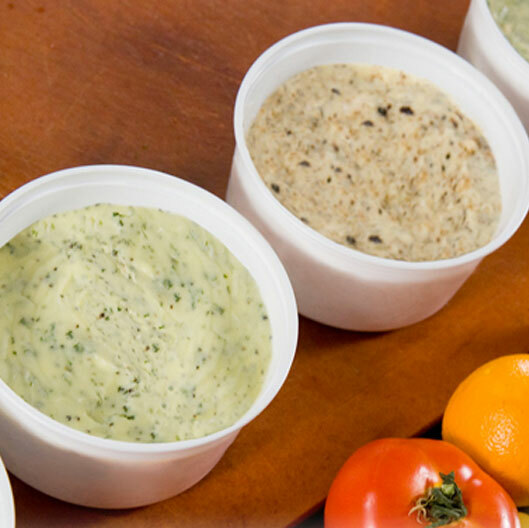 Our wide assortment of embossed tabletop butters and flavored compounds can be purchased from a Butterball® Farms distributor in your area. Or reach out to us directly to create a custom butter together. Get inspired: delicious recipes rich with real butter. Find exciting new dishes for your menu using our delicious products.